This info is for purchasing a painting direct from Holly Van Hart. To contact one of the fine art galleries that represent my work, click here. If you’re not sure, please contact holly@hollyvanhart.com, (650) 646 5590, and we’ll point you to the right person. Holly Van Hart’s original paintings are created with great care using the highest quality archival materials. All original paintings are available for purchase, unless marked as Sold. Each painting is delivered with a Certificate of Authenticity. Commissions, gift certificates, and prints are also available. Each painting is museum-quality and ready to hang in the finest of homes and work spaces. Paintings are created on gallery-wrap canvas. The edges are painted a color that matches the artwork, and there is a wire on the back to use for hanging. Hanging hardware is provided. The painting does not need to be framed, but can be framed if you choose. All purchases are 100% money back guaranteed. If for any reason you are not thrilled, you may return your painting within 5 days for a full refund (less shipping). If you live in the Silicon Valley area, you are invited to come for a studio visit to see the paintings in person. Also, you are welcome take one (or 2 or 3) of my paintings to your home to try out before you make a decision. Click for details on the try-before-you-buy program. Interested in fine art prints? Click here to purchase prints. Interested in custom artwork? Click here to inquire about a commissioned painting. Original art makes an exceptional gift to be treasured for a lifetime. Click here for purchase info on gift certificates. 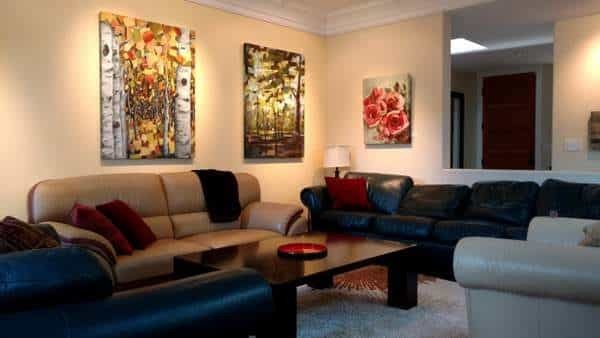 Prices are for original paintings on gallery-wrap canvas, ready to hang, with hanging hardware. These prices are valid through December 31, 2019. Other sizes gladly created upon request. State tax is added for California residents. For payment, major credit cards, Paypal, and checks are all accepted. White glove delivery and installation . . . If you live within an hour of Holly’s studio in Saratoga, CA, Holly will deliver the painting to your home and hang it on your wall. Free! Limited time offer: Free shipping within the continental United States. Outside the continental US, shipping will be charged at cost. Email me to request a quote. Your painting will be wrapped and boxed with extreme care using the highest quality shipping materials. For more information, please email me at holly@hollyvanhart.com or call 650 646 5590. Let me know what you’d like to purchase; I’ll confirm availability and send you delivery and payment details. Major credit cards, Paypal, and checks are accepted. Email holly@hollyvanhart.com to purchase a painting. Or call me at 650 646 5590. Your email/call is always welcome.